I am just beginning to use a network analyzer. 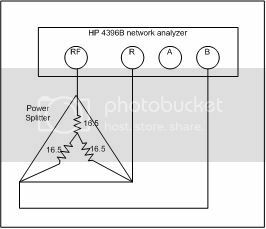 The model is HP 4396B network/spectrum analyzer. I started by trying to measure the input power at the R and B channel by changing the RF power source. The RF source, R and B channel are connected to a two way power splitter. The setup is shown below. I set the "meas" button to B to measure the power on the B channel and "meas" to R to measure the input power to the R channel. The relationship of the output power from the RF source with the measured input power to the B channel are shown below. I am a little confuse here. 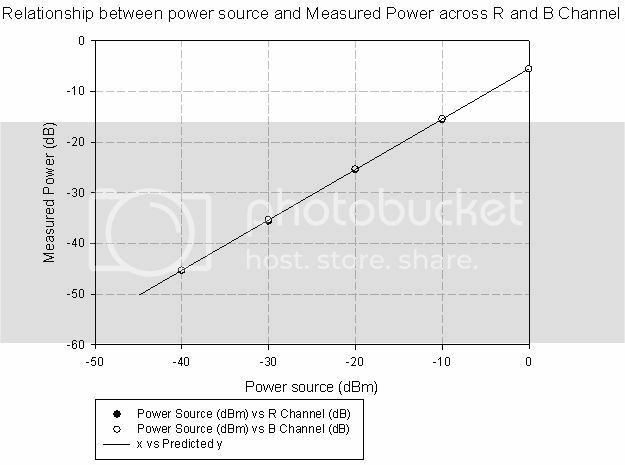 Why does the measured power at the R or B channel is larger than the RF power source? For e.g., when the RF power source was set to -10dBm, I am measuring -15dB. Is -15dB the input power at the R or B channel or I have mistakenly understand the unit? Secondly, I try to measure the response of a RC circuit with 50 ohm input and output terminated with R = 100ohm and C = 10pF. The 3dB roll off should be ~1.5MHz. I set the "meas" channel to "B/R" and later to "B". The setup, measured gain and phase are as shown below. 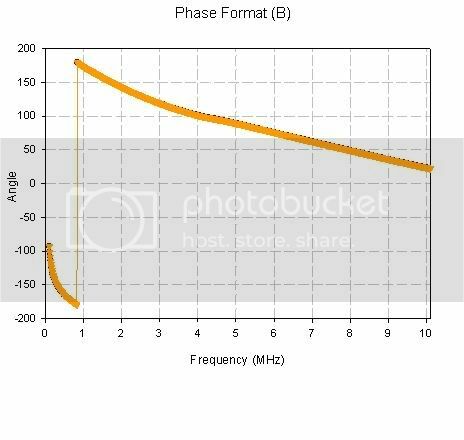 Gain with "meas" set to "B"
Phase with "meas" set to "B"
Why does the phase always change from -180 to 180? What does the phase indicate when the "meas" is set to "B/R" and "B" only? I may be interpreting your summary incorrectly but I discern an R level at any value is resulting in an approximately -5dB lower value on the B and / or R input channels. This sounds correct as you splitter is about -5dB ~ -6dB loss per leg. 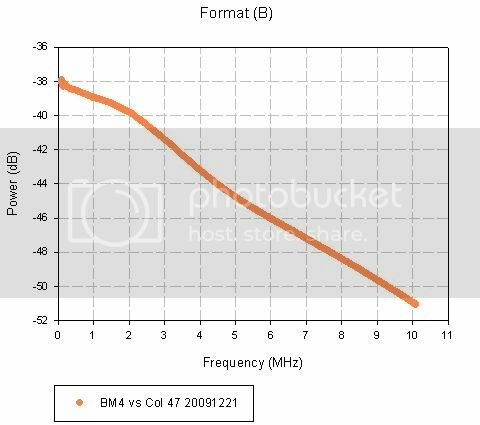 So for -30dBm out RF then R and B would be about -35dBm, i.e lower due to loss of the divider. I took our 4396B via an 11667A to the R and B inputs under a CW power sweep. Attached is the image of the responses. The marker on both R and B show -15dBm stimuls and a response of about -21.0 dBm (or so). This is exactly what one would expect. See attached. However, I a still a little confuse here..
On the upper right corner of your graph, when the marker is at -15dBm, it corresponds to -21.276dB. Does this mean that the measured power is -21.276dB which actually corresponds to -21.276dBm (with reference to 1mW of power)? Yes. The un-ratio receivers should be considered in dBm. The x-axis is source power setting. The actual source power is likely to be off up to 1 dB due to non-ideal frequency response and linearity. The y-axis dislays receiver power. Any change in phase of the source shows up in the receiver measurement. All of these problems are solved if you do b/r, because the r channel normalizes the phase response of the LO and source. Thanks for the information. It helped me a lot. I wish to clarify that if I select "B/R", and by doing a frequency sweep, am I actually measuring the power transfer function of the circuit with reference to R? Therefore, just say if the RC circuit as shown in the circuit above with R = 50ohm instead of 100ohm, could I measure the power with respect to R(reference channel) correctly? How about the measured phase? What does it physically mean? Lastly, I was connecting the network analyzer to a RC low pass filter and the phase angle should only reach -90 degree. However, in the phase plot, it appears to change linearly with frequencies. Could this be due to delay in the cable? Appreciate if Dr. Joel could further explain on the following: Sorry that I don't really get it. sometimes the phase of the receiver resets with each measurement point"
To the first question, yes, of course if there is any physical length there will be electrical delay that gives an additional phase shif. To the second question: This comment just refers to the fact that B phase by itself may not mean anything, due to the LO (local oscillator) of the VNA changing phase as freq changes. So B will appear to also change phase, but the same LO feeds the R channel, so this VNA caused phase shift is removed if you use a ratio measurement. Phase only has a meaning in the ratio, that is, output/input, or in this case B/R where B measures output signal and R measures input signal. 50 ohms or 100 ohms doesn't really matter so much in terms of S21 (b/r) response, as the impedance mismatch just causes an amplitude shift. However, I am still a little confuse. Sorry for my weak understanding in using a VNA. "50 ohms or 100 ohms doesn't really matter so much in terms of S21 (b/r) response, as the impedance mismatch just causes an amplitude shift." Therefore, if I am measuring the "B/R" response, am I actually getting the power transfer function of the circuit? If it is and if there's a mismatch which causes an amplitude shift, would my measured "B/R" response of the circuit (the power transfer function) become incorrect? Is it necessary to have the circuit to be 50 ohm terminated (for both input and output during high frequency measurement e.g. > 100kHz when measuring the "B/R" response? S21^2, the same as (b/r)^2, gives the power transfer. When you show logmag, we do the squaring (20 log b/r rather than 10 log ) so you see the power transfer ratio directly. If you are going to use the circuit as a filter, for example, the transfer function will depend upon the drive point impedance of the source, and load impedance at the output. Do you know what those impedances will be? If they are 50 ohms, then the b/r will give you the correct power transfer. If not, the please tell me what you will hook the circuit to. I am not sure if I understand your statement correctly. The circuit consist of 50ohm termination for input and output, a resistor 100ohm and a capacitor of 10pF. Kindly refer to the figure attached. 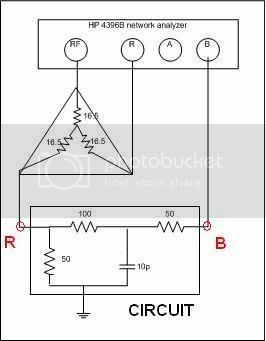 Therefore, if the input of the circuit is R and output is B, and the measure was set to "B/R", am I actually measuring the power transfer function of the circuit at point B with respect to R? If the resistance is not 100ohm and is smaller e.g. 50ohm, then would I be measuring the wrong power transfer function (due to mismatch or unbalance load)? Kindly advise. Thank you very much.